The World Series of Poker has hosted several popular events in the 2015 tournament series, but none seem to compare to the Main Event. Every player, both amateur and professional, watch and wait to see who will make the November Nine and return to fight for the coveted title and gold bracelet of the Main Event. The series event has narrowed down to just 27 players, with top pro Daniel Negreanu still in contention to make the November Nine. 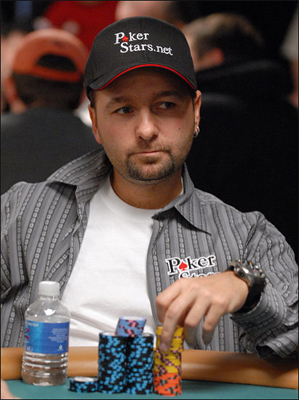 Negreanu is a popular pro who has done many things for the game as well as been a success at the poker felt. The pro has earned many titles and cash outs in his career, cementing himself as a top player in the industry. However, one title the pro has yet to earn is a Main Event win at the WSOP, despite numerous efforts. This year, Negreanu has been able to outlast the majority of the 6,420 player field to now be ninth in chips in the remaining 27 player field. Holding 8,495,000 in chips, the pro could hang out to make it to the November Nine, placing himself that much closer to earning a WSOP Main Event title win. The first place winner will not only earn the championship bracelet but also the first place prize of over $7.6 million. Going in to Day 7 game play, Thomas Kearney holds the first place spot with 14,400,000 in chips, almost double to Negreanu’s stack. Several top pros are still in contention to make the final table including Joseph McKeehen, Justin Schwartz, Pierre Neuville and Max Steinberg. Once the final 27 players were determined, the WSOP held a redraw to mix up the gaming tables for the next day of game play. The final table will soon be decided in Nevada and it is exciting to see who will make up the November Nine for 2015!